This iconic artwork represents both Jewish and baseball history. 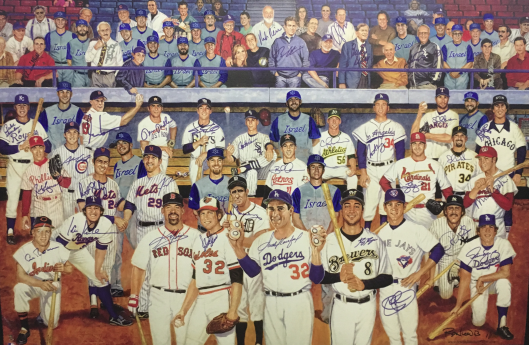 It includes facsimile signatures from 37 former and current Jewish baseball players and celebrities. Up to 35 players and other personnel associated with Team Israel will be included in the piece. 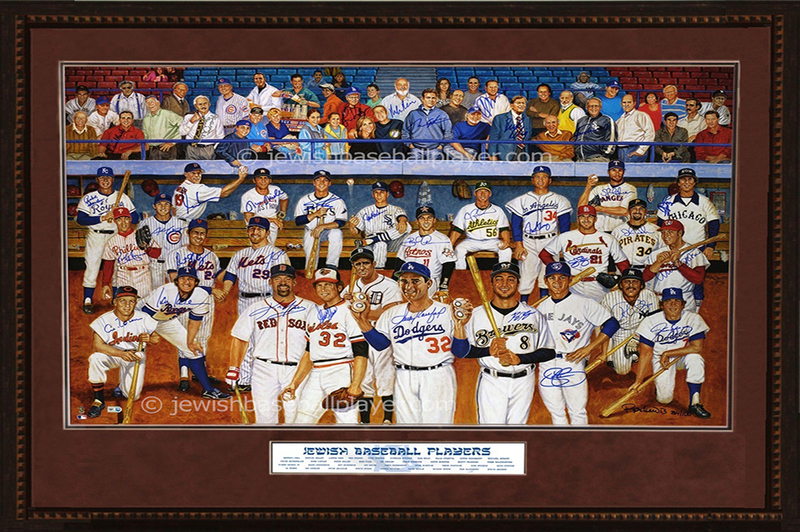 Limited to 100 pieces, individually numbered and signed by the artist and all Team Israel Players. The artist has started painting and has a deadline to get the piece to us in Korea. The more commitments we get Now, the more players will be in the piece. Ballplayer price discounted to $600. Ballplayer price discounted to $800. 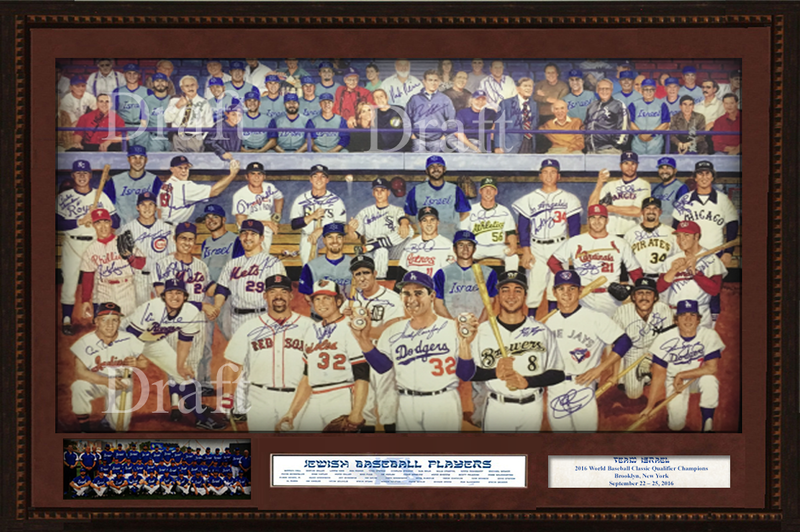 Receives the originally hand painted piece done by well known baseball artist Ron Lewis. Receives 1 extra commemorative piece to use as a gift. 2 People of your choice included in the piece. Receives $250 back in credit for every 10 pieces that are sold. Once all 100 pieces are sold, your total outlay will be reduced to only $2,500. Receives one commemorative piece with your image painted into piece. Receives $100 back in credit for every 10 pieces that are sold. Once all 100 pieces are sold, your total outlay will be reduced to only $500. If all 100 pieces are sold, you will get a bonus gift of our $600 replica version of the unaltered Jews in Baseball piece!!! Player receives one commemorative piece. Player is guaranteed to be painted into the official commemorative artwork. Donation to Israel Association of Baseball is made. Helps defer the cost of including non-sponsored players into the artwork. Due to space constraints of artwork, the final version will contain some Team Israel players included on the field, with others in the crowd portion. Team Israel execs and other personnel may also be included in the crowd. If you would like to pay by credit card, please click here and we will charge your card a deposit of $10,000 and contact you for the balance upon verbal confirmation of the details of your order.